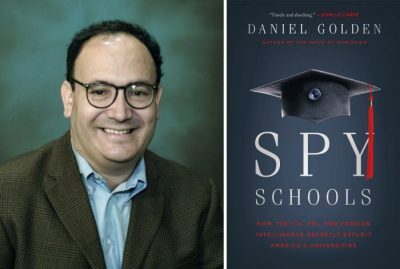 Featured image: Spy Schools: How the CIA, FBI, and Foreign Intelligence Secretly Exploit America’s Universities by Daniel Golden. Photo credit: Daniel Golden / Wikimedia (CC BY-SA 3.0) and Henry Holt and Co.
During the Cold War, our elite universities were a breeding ground for future spies. Schools like Yale and Harvard provided some of the “best and the brightest” to America’s intelligence agencies. Today, the CIA and FBI are using college campuses once again to gain new recruits in the global war for clandestine information and technology. These government agencies, in many instances, are working with the full support and blessing of professors and often top university administrators, who rely on both government contracts and the maximum revenue that comes from over one million international students in US universities. According to Pulitzer Prize-winning reporter Daniel Golden, the efforts range from small colleges to large state universities to Ivy League institutions. In fact, Golden tells Jeff Schechtman in this week’s WhoWhatWhy podcast that Harvard’s Kennedy School of Government is one of the places where spies are most actively recruited. In addition, foreign governments see US universities as an almost unlimited reservoir for obtaining intelligence and for recruiting vulnerable students who are in need of money, filled with innocence, and/or ideologically confused. Today, creative destruction has moved campus recruitment from just US efforts in the binary conflict of the Cold War to a world of high technology and spycraft that involves multiple global players, millions of foreign students and professors, and is drawing from the world’s most prestigious classrooms and research centers. Daniel Golden is the author of Spy Schools: How the CIA, FBI, and Foreign Intelligence Secretly Exploit America’s Universities (Henry Colt and Co., October 10, 2017) and The Price of Admission: How America’s Ruling Class Buys Its Way into Elite Colleges — and Who Gets Left Outside the Gates (Broadway Books, September 25, 2007).